Biotin, also known as vitamin H or coenzyme R, is a water-soluble B-vitamin (vitamin B7). It is composed of a ureido (tetrahydroimidizalone) ring fused with a tetrahydrothiophene ring. A valeric acid substituent is attached to one of the carbon atoms of the tetrahydrothiophene ring. Biotin is a coenzyme for carboxylase enzymes, involved in the synthesis of fatty acids, isoleucine, and valine, and in gluconeogenesis. Biotin deficiency is rare because, in general, intestinal bacteria produce biotin in excess of the body's daily requirements. For that reason, statutory agencies in many countries, for example the USA and Australia, do not prescribe a recommended daily intake of biotin. However, a number of metabolic disorders exist in which an individual's metabolism of biotin is abnormal, such as deficiency in the holocarboxylase synthetase enzyme which covalently links biotin onto the carboxylase, where the biotin acts as a cofactor. Biotin has an unusual structure (see above figure), with two rings fused together via one of their sides. The two rings are ureido and thiophene moieties. Biotin is a heterocyclic, S-containing monocarboxylic acid. It is made from two precursors, alanine and pimeloyl-CoA via three enzymes. 8-Amino-7-oxopelargonic acid synthase is a pyridoxal 5'-phosphate enzyme. The pimeloyl-CoA, could be produced by a modified fatty acid pathway involving a malonyl thioester as the starter. 7,8Diaminopelargonic acid (DAPA) aminotransferase is unusual in using S-adenosyl methionine (SAM) as the NH2 donor. Dethiobiotin synthethase catalyzes the formation of the ureido ring via a DAPA carbamate activated with ATP. Biotin synthase reductively cleaves SAM into a deoxyadenosyl radical—a first radical formed on dethiobiotin is trapped by the sulfur donor, which was found to be the iron-sulfur (Fe-S) center contained in the enzyme. Biotin binds very tightly to the tetrameric protein avidin (also streptavidin and neutravidin), with a dissociation constant Kd on the order of 10−15 M, which is one of the strongest known protein-ligand interactions. This is often used in different biotechnological applications. Until 2005, very harsh conditions were thought to be required to break the biotin-streptavidin bond. Biotin is consumed from a wide range of food sources in the diet, but few are particularly rich sources. Foods with a relatively high biotin content include peanuts, Swiss chard, raw egg yolk (however, the consumption of avidin-containing egg whites with egg yolks minimizes the effectiveness of egg yolk's biotin in one's body), liver, Saskatoon berries, and leafy green vegetables. The dietary biotin intake in Western populations has been estimated to be 35 to 70 μg/d (143–287 nmol/d). Biotin is also available in supplement form and can be found in most pharmacies. 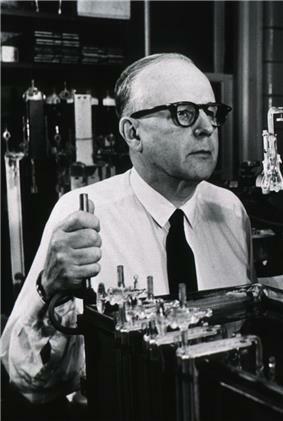 The synthetic process developed by Leo Sternbach and Moses Wolf Goldberg in the 1940s uses fumaric acid as a starting material. The frequency of marginal biotin status is not known, but the incidence of low circulating biotin levels in alcoholics has been found to be much greater than in the general population. Also, relatively low levels of biotin have been reported in the urine or plasma of patients who have had a partial gastrectomy or have other causes of achlorhydria, burn patients, epileptics, elderly individuals, and athletes. Pregnancy and lactation may be associated with an increased demand for biotin. In pregnancy, this may be due to a possible acceleration of biotin catabolism, whereas, in lactation, the higher demand has yet to be elucidated. Recent studies have shown marginal biotin deficiency can be present in human gestation, as evidenced by increased urinary excretion of 3-hydroxyisovaleric acid, decreased urinary excretion of biotin and bisnorbiotin, and decreased plasma concentration of biotin. 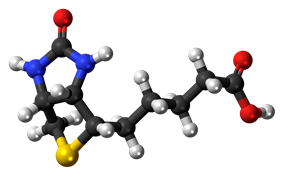 Additionally, smoking may further accelerate biotin catabolism in women. Biotin deficiency can arise due to various inborn genetic errors that affect the activity of biotin-related enzymes. Since endogenous biotin production occurs in the gut, dysbiosis could also upset the metabolic processes that allow the body to generate biotin on its own. The first demonstration of biotin deficiency in animals was observed in animals fed raw egg white. Rats fed egg white protein were found to develop dermatitis, alopecia and neuromuscular dysfunction. This syndrome, called egg white injury, was discovered to be caused by a glycoprotein found in egg white, avidin. Avidin denatures upon heating (cooking). This protein binds extremely well with biotin, making it unavailable for use in enzymatic reactions. Regardless of the root cause, the deficiency can usually be addressed directly with nutritional supplementation. The neurological and psychological symptoms can occur with only mild deficiencies. Dermatitis, conjunctivitis, and hair loss will generally occur only when deficiency becomes more severe. In severe cases of deficiency, a characteristic facial rash, together with an unusual facial fat distribution, may also be present (this has been termed the "biotin-deficient face" by some experts) (no citation provided). Inherited metabolic disorders characterized by deficient activities of biotin-dependent carboxylases are termed hyperammonemia, skin rash, feeding problems, hypotonia, seizures, developmental delay, alopecia, and coma. ELISAs often make use of biotinylated secondary antibodies against the antigen of interest, followed by a detection step using streptavidin conjugated to a reporter molecule, such as horseradish peroxidase or alkaline phosphatase. Animal studies have indicated few, if any, effects due to high level doses of biotin. This may provide evidence that both animals and humans could tolerate doses of at least an order of magnitude greater than each of their nutritional requirements. There are no reported cases of adverse effects from receiving high doses of the vitamin, in particular, when used in the treatment of metabolic disorders causing sebhorrheic dermatitis in infants. ^ "Biotin". The Free Medical Dictionary. Retrieved 2011-10-10. ^ a b "Biotin: MedlinePlus Supplements". 13 September 2013. Retrieved 2013-09-29. ^ Fiume MZ (2001). "Final report on the safety assessment of biotin". ^ "Hair Growth With Biotin". Retrieved 8 July 2014. ^ a b Otten, JJ, Hellwig, JP and Meyers, LD., ed. (2006). Dietary Reference Intakes: The Essential Guide to Nutrient Requirements. The National Academies Press. ^ Zempleni J, Hassan YI, Wijeratne SS (2008). "Biotin and biotinidase deficiency". Expert Rev Endocrinol Metab 3 (6): 715–724. ^ Marquet A, Bui BT, Florentin D (2001). "Biosynthesis of biotin and lipoic acid". Vitam. Horm. Vitamins & Hormones 61: 51–101. ^ Zempleni J, Wijeratne SS, Hassan YI (2009). "Biotin". BioFactors 35 (1): 36–46. ^ Chapman-Smith A, Cronan JE (1999). "Molecular biology of biotin attachment to proteins". J. Nutr. 129 (2S Suppl): 477S–484S. ^ Hymes J, Fleischhauer K, Wolf B (1995). "Biotinylation of histones by human serum biotinidase: assessment of biotinyl-transferase activity in sera from normal individuals and children with biotinidase deficiency". Biochem Mol Med. 56 (1): 76–83. ^ Laitinen OH, Hytönen VP, Nordlund HR, Kulomaa MS (2006). "Genetically engineered avidins and streptavidins". Cell Mol Life Sci. 63 (24): 2992–3017. ^ Holmberg A, Blomstergren A, Nord O, Lukacs M, Lundeberg J, Uhlén M (2005). "The biotin-streptavidin interaction can be reversibly broken using water at elevated temperatures". Electrophoresis 26 (3): 501–10. ^ Zempleni J, Mock DM (1999). "Biotin biochemistry and human requirements". J Nutr Biochem. 10 (3): 128–138. ^ "Biotin". HQhair.org. 2014-03-19. Retrieved 2014-03-19. ^ Gropper S.S., Smith, J.L.,Groff, J.L. (2005). Advanced nutrition and human metabolism. Belmont. ^ a b c d Combs, Gerald F. Jr. (2008). The Vitamins: Fundamental Aspects in Nutrition and Health. San Diego: Elsevier, Inc.
^ Bowman, BA and Russell, RM., ed. (2006). "Biotin". Present Knowledge in Nutrition, Ninth Edition, Vol 1. Washington, DC: International Life Sciences Institute. ^ a b Higdon, Jane (2003). "Biotin". An evidence-based approach to vitamins and minerals. Thieme. ^ a b Wolf B, Grier RE, Secor McVoy JR, Heard GS (1985). "Biotinidase deficiency: a novel vitamin recycling defect". J Inherit Metab Dis. 8 (1): 53–8. ^ "Overview of Protein Labeling". De Clercq PJ (1997). "Biotin: A Timeless Challenge for Total Synthesis". Chemical Reviews 97 (6): 1755–1792. "Biotin". DSM Nutritional Products. 2009-10-29. Retrieved 2010-05-14.